gitlab-cli a cli tool that I have written for interacting with Gitlab. Currently the tool focuses on working with issues for a project. It is written in Go and works cross-platform (works with Windows, Linux and OS X). Refer to the project README page for installation instructions. Run 'gitlab COMMAND --help' for more information on a command. Whenever you run the gitlab command, it tries to find the Gitlab.com repository with which it has to interact. The tool does this by reading the remote-url for the remote titled origin in the current folder. Alternatively it supports the --pid flag for specifying the project in the form of <namespace>/<repositor-name> from any folder. The remote titled origin for my repository points to git@gitlab.com:shank/gitlab-cli-demo.git. 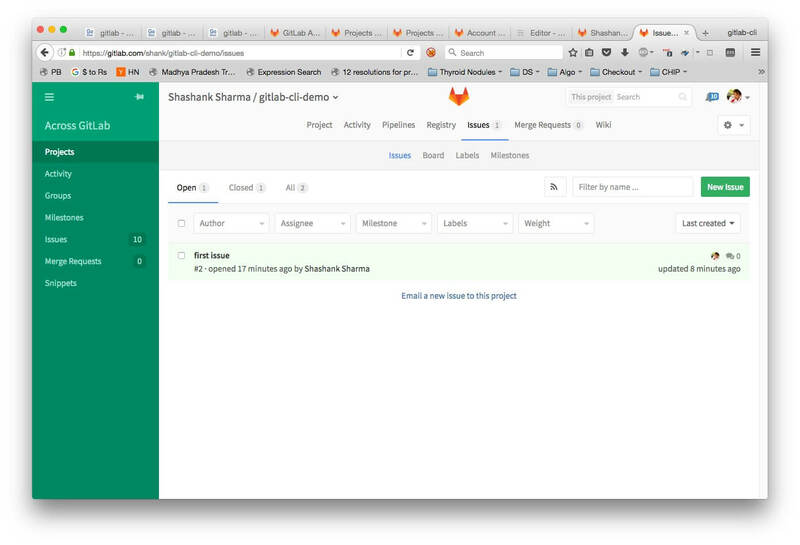 So gitlab would identify my project id as shank/gitlab-cli-demo. So, what can I do with issues? Run 'gitlab issues COMMAND --help' for more information on a command. Lets see how to create an issue. Lets go ahead and create some issues. ⏚ [shank:~/Projects/gitlab-cli-demo] master ± gitlab issues create "first issue"
⏚ [shank:~/Projects/gitlab-cli-demo] master ± gitlab issues create "second issue"
Let’s list the current issues for this project. The status for issue 3 is updated. But I wish to see only the issues that are currently open. The “Assigned To” column has been updated correctly. This is just a glimpse of what this tool is currently capable of. It is very much a work-in-progress. Please let me know which features should I add to it next by filing an issue on the project issues page. Head over to the project and give it a go!